Above is pictured Battery C, 60th Artillery, CAC. In the foreground is a Holt Tractor pulling one of the Regiments Trucks that has been stuck in the soft ground with a chain. Both the tractor and truck are clearly marked with the Regiments logo, a red diamond on a white rectangle. On the left side is one of the guns of Battery C, awaiting orders to fire. Shells stand at the ready and powder boxes can be seen next to the shells. The gun has it's camouflage net set up. Several men can be seen setting on the hillside reading papers and just relaxing. (1) St. Mihicl offensive, France. 1st Battalion, 12-l 4 September, 1918. 1st, 2d and 3d Battalions, 26 September-11 November, 1918. 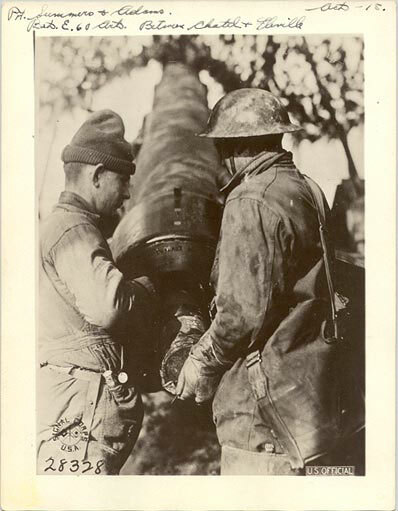 The 60th Artillery was organized in February of 1918 at Fort Monroe, VA. and was moved to Camp Stuart, VA in April of 1918 for preparation before sailing to France. On April 23, 1918 the entire regiment of 71 Officers and 1,649 enlisted men sailed aboard the transport USS Siboney from Port of Embarkation Newport News, VA.
1st Division Motor Supply Train of 16 Officers and 469 enlisted men. Balloon Detachments 1-8 of 8 Officers and 654 enlisted men. Casuals consisting of 1 Officer and 25 enlisted men and 66 enlisted men for Quarter Master Stevedores Replacements. Other ships that sailed on April 23 with the Siboney were the USS Tenadores, USS Mercury and the USS Henry R. Mallory. In August of 1917 the 8th (I) Company, Coast Defenses of Chesapeake Bay stationed at Fisherman's Island, VA. was formed into the Headquarters Company 60th Artillery. Battery A, 60th Artillery was formed in January of 1918 from the 4th (I) Company, then stationed at Fort DuPont, Coast Defenses of the Delaware. Battery E of the 60th Artillery came from the 6th (I) Company at Ft. Wool, VA, Coast Defenses of Chesapeake Bay and were moved to Ft. Monroe in December of 1917. The other Batteries of the 60th Artillery came from various Companies from the National Guard of Virginia and the district of Columbia. The 60th Artillery was one of 3 Regiments that made up the 33rd Artillery Brigade. The other two regiments were the 61st and 62d Regiments. Only the 60th saw any action at the front. The 60th Artillery was issued the French 155mm GPF Gun. The 60th Artillery received it's training at O&T Center Number 1 (Operations and Training) at Libourne, France and the firing range was at Camp de Souge near Libourne. The 60th Artillery was returned to the States after the war ended and on 26 January 1919 the regiment boarded the RMS Cedric at Brest, France to begin its trip across the Atlantic. On 4 February 1919 the Cedric reached New York Harbor and the 60th touch the good old United States soil again and went to Camp Merritt, NJ. On February 24, 1919 the regiment was demobilized at Ft. Washington, Maryland. Signal Corps photo # 23524. 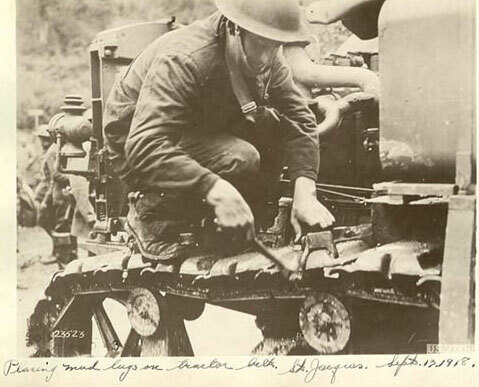 It shows two Holt 75 hp Caterpillar Tractors of the 60th Artillery pulling a gun from a ditch. Signal Corps photo # 23520 showing the 60th Regiment on the move. On the extreme left can be seen a barrel of one of the guns. Looks as if they are passing a infantry unit leaving the front. On the radiator of the tractor pulling the gun can be seen the letters "HOLT". These tractors were 75 hp models made by the Caterpillar Company. Signal Corps photo # 28329 shows Pvt. 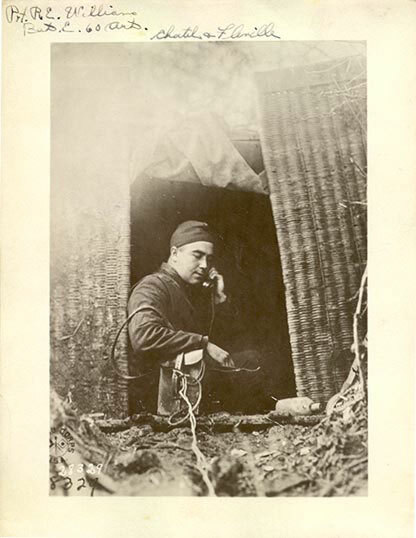 R. E. Williams operating on of the Regiments phones in Chatil Flenille, France. Signal Corps photo # 28327 shows Pvt. 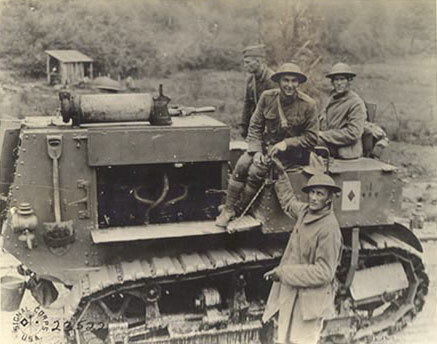 Kirkpatrick, Stevens and Jones cleaning a gun of Battery E, on October 24th, 1918 in the Ardennes. Signal Corps photo # 28324 shows a charge for a 18 Kilo shot. This is Battery E, on October 24, 1918. Signal Corps photo # 28326 shows Pvt. F. H. Stevenson firing Battery E in the Ardennes on Oct. 24, 1918. Signal Corps photo # 28328 shows Pvt. 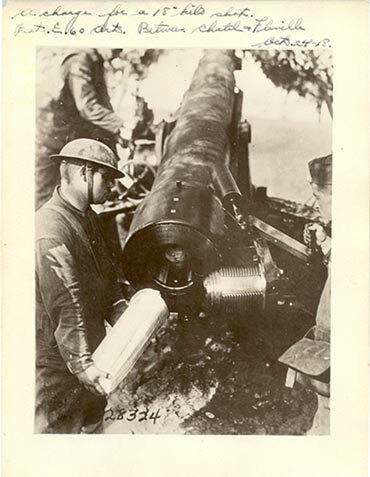 Sommers and Adams loading a shell in Battery E of the 60th Artillery. Signal Corps photo # 31986 shows Pvt. 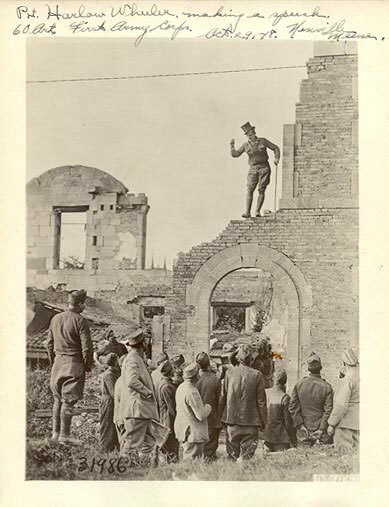 Harlow Wheeler of the 60th Artillery, First Army, making a speech on October 29, 1918. 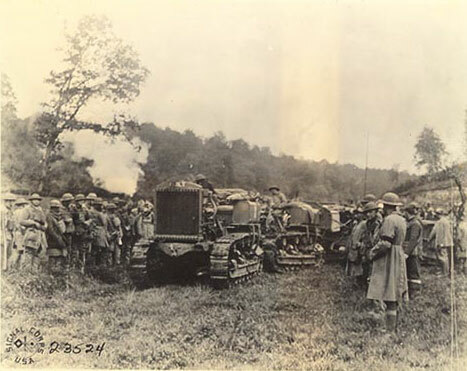 Signal Corps photo # 31399 shows 60th Artillery in Buzaney, France. 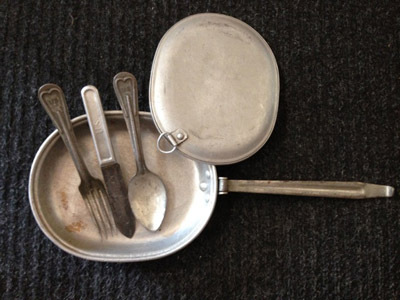 Back of the photo said "60th Artillery obtained egg cups here." As I find history and information on men who served in the 60th Artillery I will add them here in this section. If your relative served in the 60th Artillery please email me and I will add them to this list. Corporal Green was a member of Battery E, 60th Artillery and saw combat with that regiment in the St. Mihiel Offensive from September 12-16, and the Meuse Argonne Offensive September 26- November 11, 1918. He was awarded the WWI Victory medal with two battle claps and one defensive sector clasp. Previous to Green joining the army he worked as a machinist in Shelby, North Carolina. He enlisted into the United States Army on January 28, 1915 at Fort Oglethorpe, Georgia, and was placed into the Army's Coast Artillery branch on February 4, 1915. His duty station was in the 6th Company, Coast Defenses of the Chesapeake Bay. 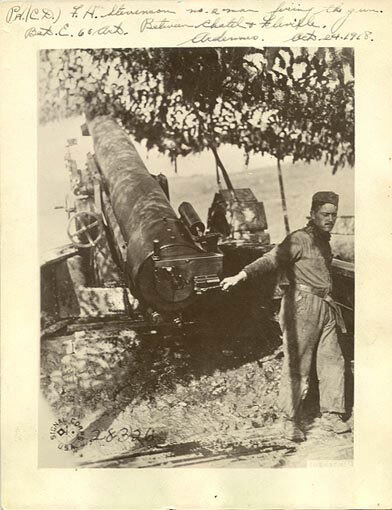 In January of 1918 the 60th Artillery, CAC was forming for service in France, and that same month Pvt. Green was reassigned to Battery E in the 60th Artillery. He was advanced to rank of Corporal on February 1, 1918 before the regiment sailed to France. The 60th Artillery sailed aboard the USS Siboney on April 23, 1918 for France. He was with Battery E through out the duration of the war, and once the armistice was signed the 60th Artillery on January 26, 1919 boarded the HMS Cedric bound for the States. They reached New York on February 4, 1919. The 60th Artillery was then in the process of discharging men and reassigning those who would be returned to their former units. Corporal Green on February 27 was then reassigned back to he former unit the 6th Company, Coast Defenses of the Chesapeake Bay then under the command of Captain Rolla V. Ladd, CAC. 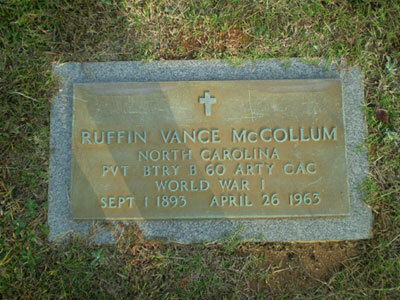 Bronze Service Grave Marker of Private Ruffin Vance McCollum of North Carolina. Pvt. McCollum served in Battery B and was born on September 1, 1893 and passed away on April 26 1963. Photo submitted by his Granson Doug McCollum. He attended OCS at Ft. Benjamin Harrison, Indiana from 27 August 1917-27 November 1917 where he was given his commission as a Captain in the Coast Artillery Corps. Captain Van Henry was assigned to Ft. Monroe, Virginia and then on 12 December 1917 Captain Van Henry sailed to France. There were 4 ships sailing on 12 December; Adriatic, Pocahontas, Susquehanna and the Antigone. The Susquehanna was the only one of the 4 transports to carry any Coast Artillery Corps units. Captain Van Henry may have sailed on the Susquehanna with the 1st Anti-Aircraft Battalion. After the 60th Artillery arrived in France in the first part of May 1918 Captain Van Henry was assigned to them. He served with the 60th Artillery at the St. Mihiel operations and also during the Meuse-Argonne operations. After the armistice Captain Van Henry did not return to the states with the 60th Artillery. It was common practice to have Officers who were regular army transfer out of the Artillery regiments and other officers who were to be discharged return with the regiment to the states. Captain Van Henry stayed in France with other duties until he returned on 5 July 1919. He was discharged from the Army on 26 May 1920. John Izard was born about 1888 in the state of Virginia and graduated from the Roanoke high school in Roanoke, VA with the class of 1906. It is not known what his fathers name was and the first record of John comes from the 1910 Federal Census and shows his family lived in Roanoke, Virginia. His father must have passed away before 1910 as his mother Roberta was listed as the head of the household. Roberta was listed as being widowed and she was 51 years old so she would have been born about 1859 and she was a native Virginian. Roberta Izard gave birth to 5 children and 4 were living in 1910. Roberta and her husband were married for 10 years before she was widowed. Roberta owned free of mortgage the home the family lived in at 1103 Commerce Street in Roanoke. Roberta Izard must have been somewhat well to do as she did not work and employed a 23-year old female cook by the name of Helen Mitchell who lived in the home with the family. When the Census was taken in April 1910 at the Izard household the family consisted of the mother Roberta and eldest son John age 23 years, daughter Alice D. age 22 years, May F. age 17 and youngest son James J. age 15 all of whom were born in Virginia and likely the house they presently lived in. By 1920 Roberta Izard had moved from the house on Commerce Street in Roanoke to another home at 201 Hillsboro Ave. in Roanoke. Roberta was 62 by this time and lived alone in the home, which she also owned. Eldest son John Izard went to college at Washington and Lee University in Lexington, Virginia and on June 12, 1907 University President George Denny presented John Izard with an Endowed Scholarship known as the Young Scholarship. This was one of 8 Endowed Scholarships given to a class of 66 who graduated and so John Izard must have been a very bright young lawyer. Three years later on June 15th John Izard graduated with the 120th session of Washington and Lee University with 113 graduates receiving their degrees. In the Lee Memorial Chapel under the shadow of the great marble statue of General Robert E. Lee, John Izard received his Bachelor of Law degree from George Denny who had given him 3 years previous his Endowed Scholarship. Following an address by former Virginia Governor Swanson a ball was held and John Izard and his date Gladys Heald of Lynchburg opened the ball with 24 other couples. After John graduated in the spring and as the summer of 1910 began he was among the society elite in the Richmond and Lexington areas. According to the Richmond Society column of the Washington Post from July 31st 1910 a camping party was being held on the North River on the Armentrout Farm near Cedar Grove, Virginia. The party was chaperoned by Mrs. Robert S. Spillman and among the 32 campers were John Izard and Gladys Heald who was John’s date at the graduation ball one month previous. As John Izard approached his later twenties he may have felt the call to serve his Country in the military. In the book Virginia Military Organizations in the World War, John Izard is named as the Regimental Adjutant of the 60th Artillery, C.A.C. 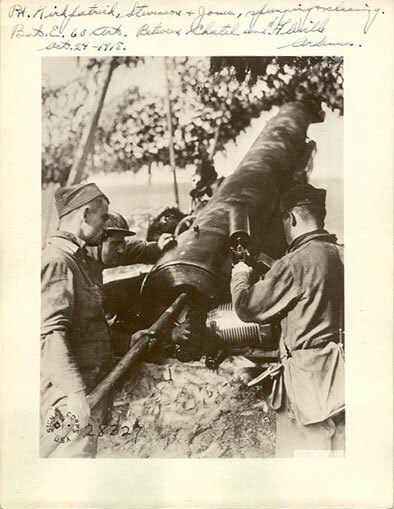 In July of 1917 the War Department issued orders forming the 60th Artillery from Coast Artillery Corps units from the Delaware, Maryland and Virginia forts. The 60th Artillery was to be commanded by Colonel Elmer J. Wallace and Captain John Izard was to be the Regimental Adjutant. This was a position John was well suited for as he was a lawyer in civilian life. Being that John Izard would have been a well-known and respected Richmond area lawyer it is assumed from his appointment by the Governor of Virginia to the rank of Captain in the Virginia Coast Artillery National Guard that Izard was not in the military before the war, but was recruited and appointed to this position to fill the need of an Adjutant for the 60th Artillery. Or he many have already been in the Virginia Coast Artillery National Guard and was with the 8th Company from Fort Monroe, Virginia as the Headquarters Company of the 60th Artillery mostly came from that Company. These men in the 8th Company would have been Regular Army Coast Artillery Men and this Company was originally formed in 1907 at Ft. Monroe. At an unknown date Captain Izard was advanced to Major while in France. After the war ended the 60th Artillery returned to the States reaching New York Harbor aboard the HMS Cedric on February 4th 1919 and on February 24, 1919 the regiment was demobilized at Ft. Washington, Maryland. Major Izard likely was also demobilized at that time, as he was a Virginia National Guard Officer and not a Regular Army officer. John Izard returned to his former life as a Lawyer and according to the 1920 Federal Census, taken on January 5th, was a Lawyer in General Practice living with his future wife. Izard was listed as a boarder in the home of Lula Andrews of 177 Park Place in Saranac Lake, New York in Essex County in the picturesque Adirondack Mountains. Lula Andrews was a 61-year old widow and her daughter Elizabeth A. was a single 25-year old woman. Elizabeth and John Izard may have met after his return from France or they may have known each other before the war but one thing is for sure they fell in love and married that same year. Also living in the Andrews home was a 45-year old single female named Mary who was a servant employed by Mrs. Lula Andrews as a cook. Lula D. Andrews was born in Texas about 1856 and her husbands name was Adolphus Andrews who was born in Georgia about 1838. On the 1900 Federal Census Adolphus and Lula were living in Oak Cliff, Texas in Dallas County. Adolphus occupation was listed as a Capitalist and may have been quite well to do. They employed 2 servants in the home and the family consisted of 3 daughters and 2 sons. John and Elizabeth moved to several locations on the East Coast and lived in the State of Connecticut in 1962 when Elizabeth was issued her Social Security number. It is not known when John Izard died but Elizabeth at the time of her death in August of 1984 at the age of 90 years was living in Asheville, North Carolina. According to the 1930 Federal Census John and Elizabeth were living in Biltmore Forest, North Carolina in a home that they owned, which was valued at $35,000. John was working as an Insurance Agent and apparently was doing quite well as $35,000 home in 1930 was quite a lot. John employed 3 servants in the home, 2 maids and one butler. Also living in the home at that time was Elizabeth’s mother Lula Andrews. John and Elizabeth had 2 sons by then, John, jr. age 7 and Robert A. age 5; both boys were born in Connecticut. Halden Lewis Hatfield was born November 18, 1895 in Ossian, Jefferson Township, Wells County, Indiana, the second of seven children of Robert Lowry and Mary Sarah (Milliken) Hatfield and the second of two sons. He grew up in Ossian graduating in 1915 from the Ossian High School. At the turn of the century in April of 1900 the Hatfield family lived on a farm that Robert farmed. Robert Hatfield had been born in January of 1868 and his wife Mary was born in June of 1875 also in Indiana. Mary and Robert had 3 children the eldest was a son named James N. born in May of 1894 followed by Halden Lewis born on November 18 of 1895 and lastly a daughter named Margaret R. born in October of 1898. By April of 1910 the Robert Hatfield family had moved from the farm to live with Robert’s mother, who lived in the town of Ossian, Indiana. Ann Hatfield was a widow and had been born in Pennsylvania about 1833. By then Robert and Mary had two more children, daughters Florence S. and Dorothy S. The father, Robert was then working as a Carpenter to support the family. Halden enlisted into the Army in response to America's call for volunteers on 2 May 1917 at Fort Wayne, Indiana. He was initially trained at Fort Thomas, Kentucky then assigned with the 1st Company, CAC at Fort Hunt, Virginia on 1 June 1917. He was qualified as First Class Gunnery on 27 Oct 1917. Eventually, Halden was assigned to Battery D, 2nd Battalion, 60th Regiment, CAC on the 8th of January 1918 and sent overseas to France. He was a member operating Canon de 155 Grand Puissance Filloux (GPF) heavy artillery pieces of which Battery D possessed four. 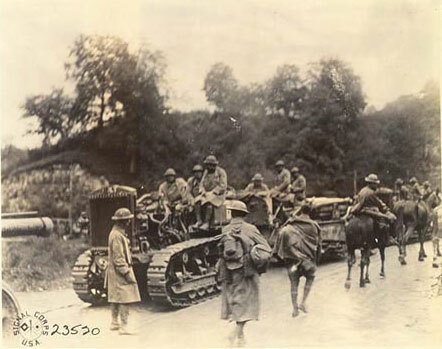 The 60th Regiment left the United States in 23 April 1918 arriving at Brest, France on May 6th, 1918 and proceeded three days later to the vicinity of Libourne (Gironde) for training from 10 May to 22 July 1918. Gradually, it moved to St. Jean d'Illac (Gironde) from 22 July to 8 September. On 11 September, it was then ordered to be attached with the American First Army area (Jaillon, Meurthe et Moselle) where it participated in the St. Mihiel Offensive (12-16 September 1918). The so-called "Salient at St. Mihiel" had existed since 1914 when the Germans launched a series of offensives between 19-25 September. Following a four-hour bombardment by 2,971 guns, the Allied assault was launched between 12-13 September 1918 by thirteen American divisions (totaling 216,000 men) of the Liggett's U.S. I Corps and Dickman's IV Corps of the American First Army under Major General "Blackjack" Pershing from the south and the U.S. V Corps under Cameron attached to the French Fourth Army from the north. Eight divisions of the French II Colonial Corps (totaling 48,000 men) under Marshall Blondlat attacked from the west. The assault fell on the "Salient" which contained approximately 75,000 combined German and Austro-Hungarian troops. The largest array of aircraft yet assembled (over 1,500) supported the attack. The overwhelmed Axis forces crumbled under the onslaught escaping northeast toward Field Marshall Fuchs German Detachment 'C'. While the total combined Allied casualties numbered approximately 8,000, the Germans suffered horrific numbers in dead and wounded, with 13,250 prisoners and nearly 460 guns falling to the Allies in less than thirty hours. Total Axis losses could have been much higher but German intelligence had ascertained an Allied attack was imminent allowing German commanders some warning to begin plans for saving a portion of their forces. The 60th CAC left the area on the 17th of September moving to Neuvilly, Meuse still assigned as a unit of the American First Army. The 60th arrived on September 21st staying until the 29th when it moved to new location at Montblainville, Meuse (29 Sep-13 Oct). Subsequently, it was moved several more times to positions near Fleville (13-23 Oct), Cornay (23 Oct-1 Nov), Sommerance (2-4 Nov), St. Juvin (4-5 Nov), Busancy (6 Nov), and Sommauthe (7-11 Nov). It was credited for battle participation during the Meuse-Argonne Operation from 26 Sep-11 Nov 1918. During this campaign, Pershing's American First Army was flanked on the west by the XXXVIII Corps and the east by XVII Corps of the French Fourth Army. Directly facing them were elements of the German Fifth Army (the German Gen KDO 58 & the German XXI Corps). The American objective was to clear the Argonne Forests, which they managed to do in savage fighting, sometimes hand-to-hand. After the fighting tapered off, the 60th was moved back to Brieulles from 11-16 Nov then Lissey, both near Meuse, from 16-26 Nov 1918. Soon the War in Europe ended with the Axis surrender and the unit was returned to America on February 4th, 1919. They were temporarily billeted at Fort Washington, just south of Washington, D.C. before being shipped to Camp Sherman in Chillicothe, Ross County, Ohio on 11 February as part of the 10th Company, 3rd Training Battalion, 158 D.B. for exchange. Private Halden Lewis Hatfield was formally discharged on the 20th day of February 1919 being paid $37.93. He returned to Ossian via train. Halden lived in his father and mothers home, which was located on Wells Street in Ossian. In the home with his mother and father were his grandmother Ann who was now 87-years old and his sisters Florence and Dorothy and also two more sisters named Elizabeth and Martha. Robert was still working as a carpenter and Halden was working as a furniture salesman. Halden married Miss Lena R. Holmes, daughter of Ora Orren and Edith Alma (Swartzwalter) Holmes on July 6, 1920 in Ossian, Indiana. They remained in Ossian briefing owning and operating a restaurant and working for Ossian Lumber, eventually rising to Manager. He was also a member of the Ossian Masonic Lodge (for 67 years at the time that he died). Halden and Lena had two children, Jean Patricia Hatfield and Rex Wendell Hatfield. Lena passed away on April 15, 1965 at Wall Lake in Lagrange County, Indiana. Halden passed away October 6, 1986 in Meridian, Mississippi according to the Social Security Death Index. Both he and Lena are buried in the Oak Lawn Cemetery in Ossian. At the National World War One Memorial, there is a brick inscribed with Halden's name and unit placed there in his honor. One final note, Halden's youngest sister, Martha Pauline "Polly" (Hatfield) Brubaker who just passed away on October 14th, 2010 in Manchester Indiana used to tell a story about Halden. It seemed that when Halden came home from the war, someone said to her, "Polly, guess who's here?" Halden came in wearing his gas mask from the army. Polly, who was only around 5-years old at the time, had said she burst into tears because it scared her. "Here was some guy with a bug's head!!" Captain Lewis A. Coffin, Jr.
Lewis Augustus Coffin, Jr. was born on July 21, 1892, and was the son of noted Otolaryngology surgeon, Dr Lewis Augustus Coffin, Sr. In addition to graduating from The Choate School in 1908, he went on to attend Columbia University to acquire his Certificate in Architecture in 1914. In 1910 the Coffin family consisted of Lewis Sr. and his wife Grace who had been married for 30-years, and thee children; eldest daughter also named Grace after her mother; second eldest was Lewis Jr. named for his father and youngest son George. In the home, which was located at 156 West 58th Street in Manhattan lived a Dr. Frank J. Parker who was 37-years old. 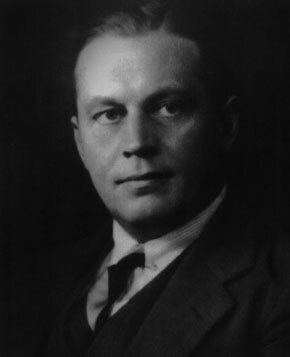 Dr. Parker may have been working for or with Dr. Lewis Coffin Sr. The Coffin family was quite well to do as in the home they employed 5 servants, one maid and one chauffeur, all of whom were living in the Coffin home. Additionally there was the sister to Grace, Gertrude E. Geer living in the home. Her noted occupation was listed as laundress. By the early spring of 1917 Lewis Jr. was now living at 329 West 70th Street in New York. He was now working for himself as an architect where his office was located at 15 East 40th Street in New York. He began his career in architecture and then after he was discharged from the army joined Henry Polhemus as partner, to form Polhemus & Coffin in 1919. As America was pulled into the First World War Lewis Jr. on June 5, 1917 registered for the Federal Draft, as he was required to. Lewis was a tall slender man with bluish gray eyes and dark brown hair. And being that he was an educated man the army saw him as officer material. After all they were in need of educated men to fill the ranks of the soon to be swelling officer corps that would be need to command the ranks of new enlisted men that would soon begin to rapidly expand the army. Once selected by the Army Lewis Coffin Jr. was likely commissioned at the rank of Captain due to his education and was assigned to the army’s Coast Artillery branch. On Armistice Day on November 11, 1918 he was serving as a Captain in the 60th Artillery, C.A.C. and would have been with the 60th during their time on the firing line in the last months of the war. While in France being a trained architect Lewis was destroying French buildings with artillery shells and it is likely here while in combat that he had the beginnings of his love for the French architecture take root. After the war Lewis returned home to live with his parents. Still at home were his elder sister Grace and younger brother George. Gertrude Geer was also still with the family. On July 21, 1920 Lewis Coffin married Grace Sands Montgomery but this would be a short-lived marriage as by April of 1922 the couple were divorced. It was on one of his French trips to Paris that the divorce took place. Lewis A. Coffin's affinity and passion for French country structures and style became quite evident as his firm designed many notable single dwelling homes throughout the New Jersey, New York and Connecticut areas. Lewis Coffin would travel to France numerous times for research and to survey examples for the book his firm published. He also designed a few homes in the once artistic community of (one-time summer residence of Mark Twain), Onteora Park Historic District just outside of Tannersville, Greene County, upstate New York, as this had been a long-time family summer retreat for decades. Onteora Park was added to the National Historical Register in 2003, which included at least one of Coffin's designs, however the remaining designs must wait until the time qualification is reached. The second marriage of Lewis Coffin occurred on October 6, 1925 to Lois “Lolly” Grace Smith. This marriage would produce two children, daughter Joan M. born in 1927, who is still living (2014); and a son aptly named Lewis A. Coffin III born in 1928. He like his grandfather would pursue the medical field and became a doctor, passing away in 2002. By 1930 the Lewis and “Lolly” lived on East 85th Street in New York with their two children. The Coffin’s employed three servants who lived in the home with them. All three servants were born in Ireland. Lewis A. Coffin, Jr. died in 1963 in New York City. 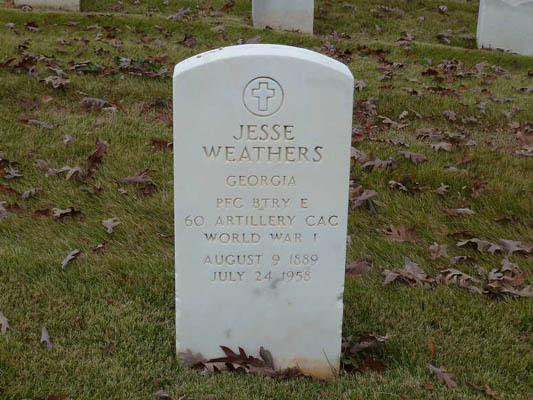 Jesse Weathers was born on August 9, 1889 in Florida. He lived most of his life in Georgia and called that state his home. 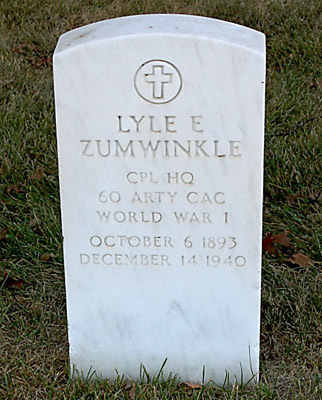 Among the many thousands of grave stones in the Fort Snelling National Cemetery in Minneapolis, Minnesota there is one located at site 1248 of Section A-7 with the inscription; “Lyle E. Zumwinkle Cpl HQ Co 60th Arty CAC World War I October 6, 1893  December 14, 1940” and on the reverse side is this inscription “ His Wife Minnette C. October 30, 1896  June 5, 1967” What can the words of the inscription on this stone tell us about Lyle Zumwinkle and his wife Minnette? Lyle Edwin Zumwinkle was born to George E., and Edith (Elliott) Zumwinkle on October 6, 1893 in Morton, Minnesota. Lyle’s father George supported his family of two children, Lyle and his sister Gladys who was born on May 21, 1895, by working as a clerk at the King Brothers dry goods store in Redwood Falls and also a clerk at a grocery store in Minneapolis. The family lived in and around Minneapolis-St. Paul area during the turn of the century and George had purchased an 80-Acre tract of his father’s farm and the family lived there. The Zumwinkle’s attended the Methodist Episcopal Church in Morton. As young Lyle grew to be a young man he wanted to make practicing law his profession, and as such in 1912 enrolled into the law school at the University of Minnesota. As Lyle’s 4-years at college progressed there were other events in the world that would merge with his life’s path. In the spring of 1917 as he was about to graduate from law school the world had exploded into a war and America was not immune. The United States Army was in need of educated men to fill its swelling ranks to fight in this war. On June 20, 1917 Lyle E. Zumwinkle, a short statured man with blue eyes and brown hair registered for the Federal Draft as he was required to do. At the time he was 23-years old and he listed his address as 716 Thirteenth Ave. S. E. in Minneapolis. He was still attending Law School and he listed Attorney E. S. Green as his employer. Lyle was single and did not claim any exemption to the draft. 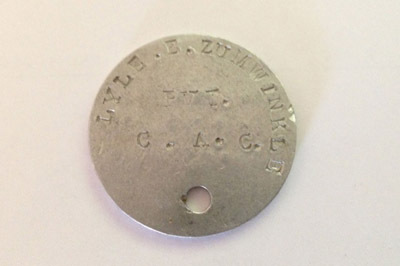 Lyle Zumwinkle likely enlisted into the army in late 1917 likely at Fort Snelling. He was assigned to the Headquarters Company of the 60th Artillery, C. A. C. as a Private. He would have sailed with the 60th to France on April 22, 1918 and served in France with the 60th during their combat on the front lines. Private Zumwinkle during his service while in France was advanced to the rank of Corporal and would have participated in battle with the 60th during the Offensive actions at St. Mihiel and during the Meuse-Argonne battle. Corporal Zumwinkle would return from France on January 22, 1919 with the 60th Artillery and likely was Honorably Discharged from the Army in May of 1919. Once again a private citizen Zumwinkle returned to Minnesota and his family. By 1920 Lyle Zumwinkle was living in Pelican Township in Ottertail County, Minnesota, which is located in west central Minnesota. There he was practicing law and may have had his own private practice, which was likely in the small village of Pelican Rapids. It was here that he met Minnette A. Cummings and by late 1920 or early 1921 they were married. By 1922 Lyle and Minnette had their first child, a son named Robert. This was followed a year later by a daughter named June and second son named Richard about 1924. Then about December 1929 another daughter named Barbara was born. 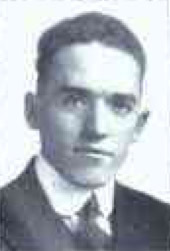 Lyle was an active American Legion member and about 1929 was elected State Commander of the Minnesota American Legion. About this same time the family had moved a bit farther north to a small town named Thief River Falls, Minnesota, which was 25-30 miles north east of Grand Forks, North Dakota. But the growing Zumwinkle family did not remain in Minnesota and by April of 1930 Lyle had taken a job as a lawyer for the Veterans Department and had moved to Bethesda, Maryland. The Zumwinkle family was now living in a rented home located on the Old Georgetown Pike in Bethesda, which was Maryland Highway 187. The home was located on the busy concrete highway of an east coast city, likely a very big change from life in the small north woods and lakes of Minnesota. The government job was not long term and by the beginning of 1935 the Zumwinkle family was back in the lakes and woods of Minnesota. Lyle and Minnette and the 4 children were living in a 3-story brick-housing unit on a quiet tree lined street in Minneapolis. The home was located at 905 West 25th Street at the corner of South Bryant Ave. Within 5-years of the family moving back to Minnesota from Maryland another change would take place in the family. In late 1940 Lyle would fall into ill health and on December 14, 1940 while he was a patient in the Veterans Hospital in Minneapolis, would pass away leaving his wife Minnette to carry on and look after the 4 children. Lyle was then buried in the Fort Snelling National Cemetery, his white marble grave stone with the inscription of “Lyle E. Zumwinkle Cpl HQ Co 60th Arty CAC World War I October 6, 1893  December 14, 1940.” There he would quietly and peacefully rest and wait for his beloved wife Minnette when she passed away on June 5 and was buried on June 8, 1967 next to Lyle and her inscription was added to his grave stone. But the story of Lyle Zumwinkle does not end there in the Fort Snelling National Cemetery. Seventy-five years after Lyle was laid to rest his grandson, Scott Mathewson who is the son of Lyle and Minnette’s youngest daughter Barbara, is looking at the small box of wartime relics of his grandfather Lyle. 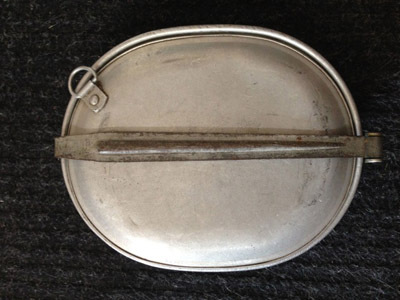 In this box Scott has are Lyle’s dog tags, his mess kit and a wartime souvenir, which is a leather German Army belt with the metal buckle with the German Army crest and the words “Gott Mit Uns” which translated means God is with us. This was a common German army phrase for many years. Scott related how unfortunately his mother Barbara knows very little about her father Lyle’s service in WWI. Scott stated, “It was something that she and her mother Minnette never talked about, and my Aunt Jean hated war and wanted nothing to do with these remnants.” Scott tells that his Uncle Richard was a conscientious objector in WWII and served time in prison and his Uncle Robert, who was Lyle and Minnette’s eldest son was a Submarine captain in WWII. Scott continued in telling about how as a young boy there was among Lyle’s mementos a gas mask from WWI, and Scott remembers playing with it as a little kid in the early 60's. His mother Barbara threw it away many years ago as it was falling apart and she didn't like it! Scott commented “Now that I have possession of these few pieces (I have some flags, medals and other souvenirs he collected) I'm very interested to get more info on my grandfather. And from the inscription on the white marble gravestone and some research, this was the story of Corporal Lyle Edwin Zumwinkle, Service number 632246, Headquarters Company, 60th Artillery, Coast Artillery Corps. 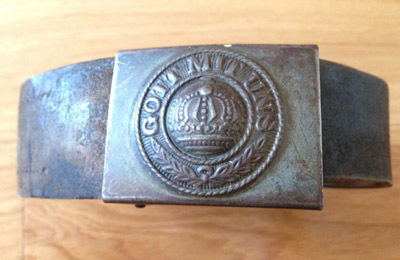 This was a German Army belt taken by Lyle as a wartime souvenir. It shows the German Army Crest and the words “Gott Mit Uns” which was a very common phrase on German military items during that time frame. Translated means God is with us. In the Beech Grove Cemetery located in Muncie, Indiana there is a simple white Military gravestone that has blackened over the years, with several chips along the edges. There is an evergreen bush partially overtaking the stone that is embossed with a Christian Cross above the name, which seems to set quietly not calling much attention. But this stone deserves to be remembered for whom the man was that rests in this grave, and he has a story of devotion to his Country and fellow citizens and his family that needs to be told and remembered. For this man gave his life protecting these things he held dear. Toney C. Hellis, or Anthoney Charles Hellis was born about 1899 in Muncie, Indiana. The Hellis family was German and Anthoney’s parents both came from Germany, making Anthoney and his siblings’ first generation Americans. The devotion to Country by the Hellis family did not rest solely with Anthoney, as there were several family members who would also carry this same torch of devotion. The first recorded notations of his life come from a 1917 edition of the Muncie City Directory, in which Anthoney Hellis is listed as living at 2804 South Elm Street, and worked at the Hinde-Dauch Paper Company in Muncie. From the 1917 Muncie City Directory there are clues as to who Anthoney’s parents were. At the same address listed in the 1917 Directory, at 2804 South Elm Street, there is a John J. and Josephine M. Hellis listed who were his parents. Additionally, there is Frank, Lena M. Sallie and Stanley J. Hellis also listed at that address. Frank, Lena, Sallie and Stanley were his siblings. In 1917 Anthony along with John, Frank, Sallie, and Stanley all worked for the Hinde-Dauch Paper Company in Muncie. In 1917 as America was preparing to go to war Anthoney or “Toney” as he was known, joined or was drafted into the army. He would be the first in his family to carry the torch of devotion to Country. Toney Hellis served in the army’s Coast Artillery Corps branch and was serving with the 60th Artillery. Private Hellis sailed to France with the 60th and participated in combat at the St. Mihiel operations and also during the Meuse-Argonne offensive. Once the war was over Pvt. Hellis was returned to the States with the 60th Artillery, and was discharged from the army likely in late February 1919. After the war Toney in 1919 fell in love with Rhea Margaret Stump. Toney and Rhea were married in Muncie on November 26, 1919 and made their home at 918 West 13th Street in Muncie, which was the home of Rhea’s parents, Isaac and Nora Stump. Also living at the 13th Street home was Rhea’s two younger brothers, Emory and Lewis. Emory and Rhea along with Toney all worked at the Hinde-Dauch Paper Mill. Rhea’s father Isaac worked as a truck driver hauling freight. Toney and Rhea had their first child, a son named Charles Anthoney Hellis, on August 28, 1920, and a second son named Albert H. Hellis, who was born on July 21, 1922. Soon enough the Stump’s home was not big enough for the growing Hellis family and Toney and Rhea and the two boys had moved away from her parent’s home on 13th Street to a home of their own at 1009 West 12th Street in Muncie. About 1921 Toney had quit his job at the paper mill and taken a job with the Muncie Police Department working as a patrolman, again serving is fellow citizen in a higher cause. Life for the Hellis family in Muncie for the most part was quiet and easygoing as any other mid-western city of its size. 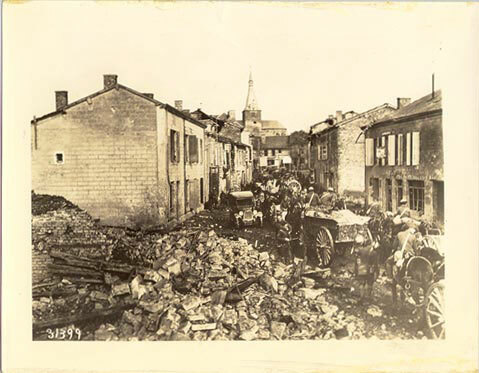 But on Sunday September 30, 1923 that all changed for the Hellis family in a split second. While on duty Patrolman Toney Hellis responded to a police call, and once on the scene Patrolman Hellis found it was a domestic disturbance call where a husband was beating his wife. When Hellis and the other officers arrived the suspect fled the scene on foot and Hellis gave chase on foot. Unknown to Patrolman Hellis the man was armed and at a point in the foot chase the suspect suddenly stopped, turned and fatally shot Patrolman Hellis. The suspect then fled again and remained on the run for two more days until finally he returned to his home where he committed suicide. Patrolman Toney C. Hellis would become the first Muncie Policeman to be killed while on duty. When a police officer is killed in the line of duty not only does his family mourn, but also the entire city mourned. Now Rhea was left to raise the two boys, Charles and Albert, alone. After Toney’s death Rhea and the boys were living at 1223 West 10th Street in Muncie. After three years she remarried on July 3, 1926 to Claude C. Burris. This marriage did not last very long and by April of 1930 Rhea had divorced Claude Burris, and she and the two boys were again living back at her parent’s home on 13th Street. Rhea was then working as a box maker back at the Hinde-Dauch Paper Company in Muncie. But by the fall of 1931 Rhea again remarried, and on October 24, 1931 she had married William A. McKinley. This marriage would last the rest of her life with Rhea and William living on in Muncie. The example of service to fellow countryman and citizen that Toney Hellis showed with his life was passed on to others in his family. Toney’s brother, Stanley J. Hellis followed his brothers example of servanthood, serving in the Army with the Motor Transport Corps during WWI, and as a civilian as a fireman for the Muncie Fire Department for many years. And Toney’s two sons Charles and Albert also carried the torch of servanthood that their father had impressed onto them. Charles the eldest son, served as a rifleman with Company B, 407th Infantry, of the 102nd Infantry Division in combat in Europe during WWII, and Toney’s youngest son Albert also served as a Sergeant in the Army during WWII. Charles Hellis the eldest son of Toney and Rhea would live for several years in Muncie before moving to Terre Haute, Indiana where he passed away on August 12, 2010. Albert the youngest son lived all his life in Muncie and he passed away on July 15, 1998 and is buried in the Beech Grove Cemetery, which is the same cemetery his father Toney is buried at. 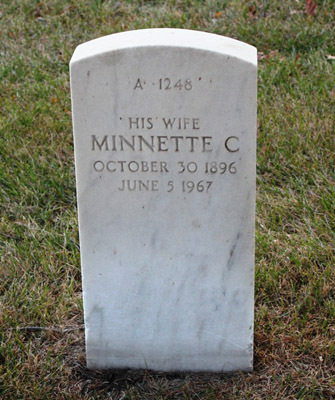 Toney’s wife Rhea would pass away in 1978 and is buried at the Gardens of Memory Cemetery in Muncie with her third husband William A. McKinley. 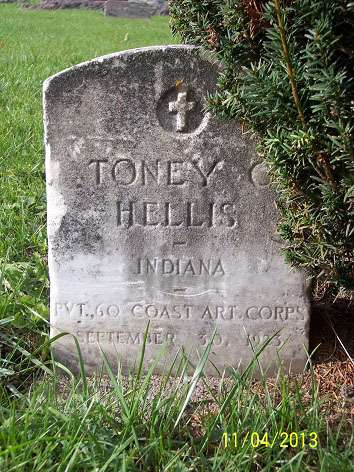 But at the Beech Grove Cemetery there is a simple Military white gravestone that sets unattended marking the grave of Toney C. Hellis, which today stands silently alone marking the spot where the man, who carried that torch of devotion to his fellow citizen, lays resting in peace. In the Beech Grove Cemetery the simple Military white gravestone that sets unattended marking the grave of Anthony Hellis stands silently alone marking the spot where the man who carried that torch of devotion to his fellow citizen lays resting in peace. Patrolman Anthony C. Hellis, Muncie, Indiana Police Department. Dewey Henry Bickel served as a Private in Battery A of the 60th Artillery, CAC, and little would be known today about Dewey’s experiences while serving with the 60th Artillery if it would not have been for his daughter’s preservation of his experiences in the form of an oral interviews she took with her father. Donna Minick had undertaken several oral interviews with her father and on June 18, 1976 she sat down with her father Dewey Bickel and they had a conversation about his experiences in the war with the 60th Artillery. Oral interview with my father, Dewey Henry Bickel by Donna Minick, taken June 18, 1976 (portion relating to military service). Donna: What made you decide to go into the service? You went in kind of young, didn’t you? What were you, seventeen? Donna: I thought you were even younger than that? Dewey: No, John (John was Dewey’s younger brother) was sixteen, and I was seventeen. Donna: Why did you decide to go in? Dewey: I enlisted. I didn’t know any better. (Laughter) I thought it was the right thing to do, then. Donna: Is that why you did itfor patriotic reasons, or to make money? Was it a good job at that timedid they pay you well? Dewey: They paid fifteen dollars a month. Donna: Where did you enlist into the Army? Dewey: I enlisted at South Bend, Indiana. Donna: Where did you go after you enlisted? Where did you train? Dewey: We were shipped to Fort DuPont in Wilmington, Delaware. Fort DuPont was one of the forts there. Donna: What was it like while you were at Fort DuPont? Dewey: Oh, it was on a river, the Delaware River. I suppose it was right close to that, level land, built-up country. That’s where we did our training, around there. Donna: Did you stay with Uncle John all the time? Dewey: No he didn’t go in with me. Donna: Oh, you didn’t go in together? Dewey: No, nobody did, we weren’t with any of our brothers. Donna: What was it like then? Dewey: I thought I might as well get over and end it and get back home. Donna: What happened once you got over there? Dewey: Oh, we did a little more training for about a month or maybe more than that, and then we was up on the front lines for quite a while. Donna: How long were you over there in France? Dewey: I was over there for nine months in France. Donna: What part of France other than the front lines did you visit? Dewey: Bordeaux, that was a big city. Donna: Didn’t fighting also take place in a big woods? Dewey: Yes they called it the Argonne Forest, and we was up in there, and that was where a lot of fighting took place. Donna: What was that area like? Dewey: The Argonne Forest was a lot of woods. Donna: Was it like woods here with a lot of undergrowth. Dewey: No, beech and maple, same kind of trees just about. We was up there about two monthsall the time, and we didn’t come back until after the Armistice was signed in November. Donna: What did you live in? Did you have little tents or did you have to sleep on the ground? Dewey: Tents mostly. Little tents, pup tents, a couple to a tent. We was in the heavy artillery. Donna: What does that “heavy artillery” mean, big guns? Dewey: Yeah, we wasn’t marching like the infantry. Donna: How did you get from place to place? Did they have trucks that you could ride on? Dewey: Yeah, big trucks. That’s why we were more or less camped permanently for several days and then we’d move in trucks. The little 3-inch guns traveled with horsesat that time. They wouldn’t anymore. And that was terrible. But our big 6-inch guns we hauled with the trucks and tractors. Donna: Terrible on what, the horses? Dewey: Why sure. They’d shoot into them and maybe kill one horse and that’d scare the others and they’d try to run and drag the horse. There was two or three hitched to a gun. That was terrible. Donna: Did you drive them at all? Dewey: No, I wasn’t in that. That was light field artillery. We had heavy guns that shot a 6-inch shell. We didn’t have horses. Donna: Well, were you back behind where the guns were, or did they have heavy artillery shooting at your heavy artillery? Dewey: Yeah the Germans had heavy artillery trying to shoot back at us. They had heavy artillery trying to shoot bridges or when they put over boards, like ahead of the infantry. That’s what we were supposed to do, to shoot out the Germans bridges and Artillery guns. Donna: What was the food like? Dewey: It was good. We had tops. We had a good mess sergeant and he fed us good right up on the front. Lot of them can’t believe that, but we was fed good. Donna: Where did he get the foodfrom the farmers? Dewey: No from the trucks, best beef, hindquarters, just right along, so we was fed good all the way through. Donna: Were you there when the Armistice was signed? Dewey: We were up on the front. Donna: What was that like? Dewey: We couldn’t hardly believe it. One day it was all noisy and a lot of shooting and the next day nothing. Just couldn’t believe we were hardly hearing right. We didn’t know it for a day or two. Donna: You didn’t know why, but you stopped shooting? Dewey: Yeah. I suppose they got orders from the top to stop shooting, but the day it was signed, we didn’t know it for a few days afterward. We didn’t leave therelet’s see that was the Eleventhwe didn’t leave there till Thanksgiving then we started marching back. Donna: Did you go through Paris? Dewey: No never got there. Donna: Did you have celebrations? Dewey: No, on Thanksgiving Day, we ate hardtack for dinner. Donna: You didn’t have a turkey? Donna: Did you meet any of the French people at all? Dewey: Yeah, they was. We had us a French woman cook us a meal one night. They cooked over a fireplace. They didn’t have stoves. Dewey: What did you come back on? Dewey: On an English ship. We went over on an American and came back on an English ship. Donna: What did you do when you came back? Dewey: Oh, hung around North Liberty, Indiana for a while and met a fellow and he said he was going to Montana, and ask me if I wanted to go along with him, and so I went out there then for thirteen years. Dewey Henry Bickel was born on September 4, 1899 to Mary Ellen (Wharton), (b. 1869 d. 1954) and Henry L. Bickel (1865-1903). Henry and his wife Mary lived on a farm in Liberty Township near the town of North Liberty, Indiana in St. Joseph County. As stated on the 1910 Federal Census Mary had given birth to 9 children but at the time of the taking of the census on April 15, 1910 there were 7 children living. They were eldest daughter Dulica born about 1892; Clarence A. born about 1893; Carson S. born about 1896; Gertrude born about 1897; Blanche born about 1898; Dewey H. born on Sept. 4, 1899; and John G. born about 1901. Dewey’s father Henry passed away in 1903 and this left Mary alone to raise the 7 children on the farm. By 1910 Mary and the 7 children were still all together with the three eldest children working jobs to support the family. In his interview Dewey tells how he enlisted at South Bend, Indiana, but it is more likely that he may have went to South Bend, which was only about 15 miles from North Liberty and took a train south to Cincinnati, Ohio where he stated he enlisted into the Regular Army at Fort Thomas, Kentucky. He was only 17 and a half at the time and he may have went to Fort Thomas because he was so young. Once in the Army he was placed into the Coast Artillery Corps at Fort DuPont in Delaware. He would have been assigned to the First Company, Coast Defenses of the Delaware stationed at Fort DuPont. In January of 1918 another unit stationed at Fort DuPont, the Fourth Company, was formed into Battery A, of the 60th Artillery, CAC. There were calls form the other units then at Fort DuPont for volunteers for service in France and Private Bickel stated in his interview with his daughter that he did volunteer for service in France, and so that was how he came into Battery A. 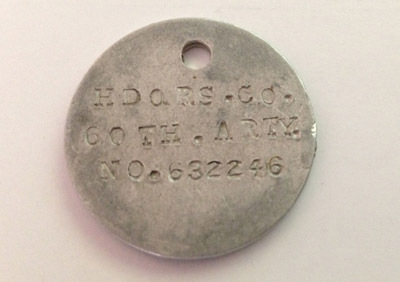 Private Bickel was assigned to Battery A of the 60th Artillery, and just before they sailed to France he was issued his new round aluminum dog tags, with his service number of 632664 stamped on it. He served overseas from April 23, 1918 to February 4, 1919 when they returned back to the States again. Private Bickel was honorably discharged from the Army on March 4, 1919. After the war Dewey returned to the farm in North Liberty, Indiana, where he stated that after awhile in North Liberty he met a friend and together they left and went out west to Montana and he remained there for 13-years before returning back to the North Liberty, Indiana area again. Dewey Bickel worked on a grain farm in Valley County, Montana, which is located in the northeastern part of Montana along the Canadian Border across from Saskatchewan. It was here that Dewey met his wife Valborg, she was born in the State of Washington on July 29, 1903 and her parents had come to this country from Denmark. Dewey and Valborg were married likely about 1925, and had a daughter named Katherine who was born about 1926 in Valley County, Montana. About 1932 Dewey, Valborg and Katherine left Montana and returned to North Liberty, Indiana, for unknown reasons. Once back home in Indiana Dewey again went to work as a farmer. About 1935 a second daughter named Rae Ellen was born and a third daughter named Donna was born in 1938. 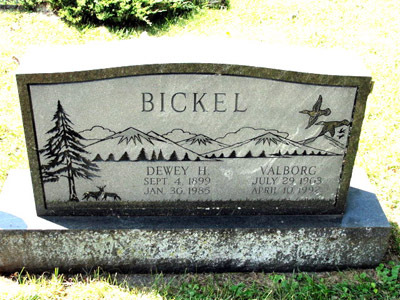 Dewey Bickel likely farmed for the rest of his life until he passed away on January 30, 1985. Both Dewey and his wife Valborg are buried in the Hamilton Church Cemetery, located at the crossroads of Chicago Trail and Walnut Road in Olive Township of St. Joseph County, Indiana just south of the Indiana-Michigan State Line. Constituted 23 December, 1917 in the Regular Army as the 60th Artillery, Coast Artillery Corps and organized at Fort Monroe, Virginia, comprising Regular Army companies and National Guard companies from Virginia and the District of Columbia. Reconstituted 26 October 1922 in the Regular Army as the 60th Artillery Battalion, Antiaircraft and organized at Ft. Crockett, Texas. Expanded, reorganized and redesignated 1 July 1924 as the 60th Coast Artillery. Surrendered 6 May, 1942 to the Japanese forces on Corregidor Island, Philippine Islands. Inactivated 2 April, 1946 at Ft. Mills, Philippine Islands. Redesignated 1 August, 1946 as the 60th Antiaircraft Artillery Automatic Weapons Battalion and activated at Ft. Bliss, Texas. Redesignated 7 December, 1949 as the 60th Antiaircraft Artillery Battalion Automatic Weapons Battalion, Mobile. Redesignated 27 July, 1950 as the 60th Antiaircraft Artillery Battalion. Inactivated 17 June, 1957 at Southampton, England. Reorganized and redesignated 31 July, 1959 as the 60th Artillery, a parent regiment under the Combat Arms Regimental System. Redesignated 1 September, 1971 as the 60th Air Defense Artillery.